The sculptors of Chartres, who like its architects and glass artists remain nameless, are to thank for much of the cathedral’s splendour. 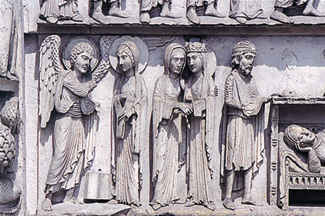 The sculpture at Chartres was intended to exceed everything that had gone before it, both in terms of the extent of its message and the quality of its representation. Unlike the stone used to build the walls, the stone for the sculpture was not taken from the local Berchères quarries. A much finer and more evenly grained limestone was used, brought at great expense from quarries near the banks of the Seine and Oise rivers in the Paris region. It would have been transported by river, along first the Seine and then the Eure. 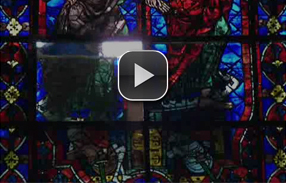 There are approximately 4,000 carved figures at Chartres. The two great portals opening on to the arms of the transept, each comprising a tripartite porch, feature a munificent decoration designed to complement the theological message given by the west portal in an arrangement and profusion of carvings unique among the great cathedrals.